This famous orchestra conducted by Pierre Couteau had just taken a new dimension by merging with the group « The Lutéciens » of Paris. The Lutéciens became recently an association under the leadership of its new president Jean Saquy. 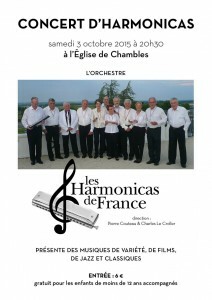 The new Harmonicas de France orchestra will participate, during two days in seminars and masterclasses, ending with an evening concert, at 9pm, on March 18th at Cozes 17120, and the 19th at Pons 17800, France. The orchestra conductor is Pierre Couteau attended by Charles Le Croller leader of "The Luteciens". This Festival will take place in Montlhery 91310 France, May 20th to 22nd. - Friday 20 : 7pm, welcome dinner/concert at the restaurant « Le Liceas », 22 Bel Air street, Z.I. L'Eglantier, Lisses 91045. 9am, open Championship Harmonicas de France, 2pm Open stage, 3pm, masterclass Antoine Leroux/Mario Scillia. 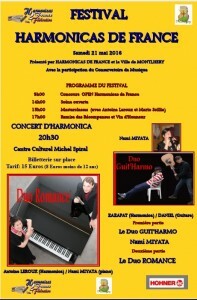 8pm, Gala Concert, featuring : Duo « Guit'Harmo », Nami Miyata, Antoine Leroux and « Duo Romance ». 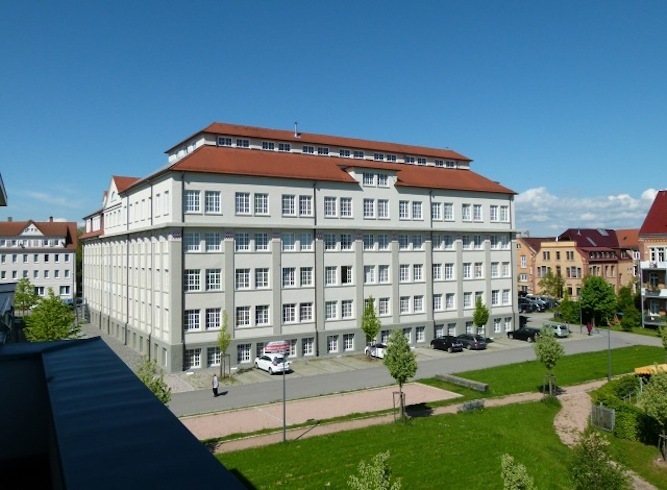 - Sunday 22: association Yearly meeting. The Batofar is a boat with a lighthouse fixed in the middle of her bridge. It's a place for artistic meetings, where artists are submitted to an applausemeter system at the end of their show. Having obtained a great success in last December, the group Armos has been asked by the dynamic team of the Batofar, to play again on February the 20th, at 7pm. Armos ensemble have been highlighting the qualities of the harmonica since 2004, with a particulary rich repertory from classic music to jazz and variety. The players are : Pierre Rochas, Gerard Margnoux, Dominique Lannes (chromatic/diatonic) and Pierre Auger (guitar). The Batofar is docking at O'Sullivans Backstage, 92 boulevard de Clichy, 75018, métro Blanche. Paris. 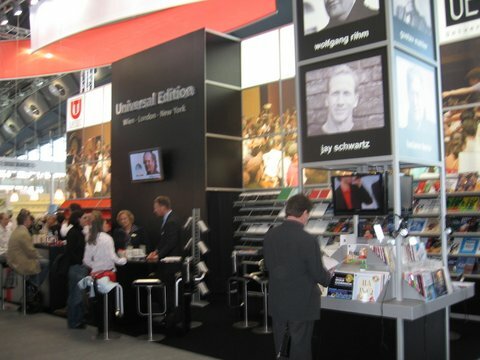 "Musikmesse" in Frankfurt am Main, Germany, is the leading international tradefair for musical instruments, sheet music, music producers and marketing. Most harmonica brands are ready to welcome you in their booths, among them : Hohner, Seydel, Tombo/Lee Oskar, Susuki, Hering, etc. Experience this unic spirit from April 7th to 10th 2016, where everything is about music and musical instruments. From pure craftsmanship to digital music production, from business contacts at the trade fair stands to performance in front of visitors on the numerous stages. Spirit of music.. Vibrate to the rhythm of the world ! Our old Harmonica and Accordion Museum will be closed definitely Sunday November 29th 2015. The evening before, Saturday Nov. 28., 7.00 p.m., we'll have a very special concert for the benefit of our new permanent exhibition: Walter Buchinger (Austria) and Rainer Schubert (Germany) will play with a team of 25 musicians a Chordomonica Concert to celebrate "50 years Chordomonica" and two more anniversaries. 50 years harmonica in outer space (Dec. 16 1965) and the 50th anniversary of Director Ernst Hohner's death (the famous grandson of founder M. Hohner who died on October 16th 1965). If you cannot join the good bye events end of November 2015, come to visit the new museum and our many events next year. We hope for donations of fans and enthusiasts worldwide to get the missing equipment and to be able to re-finance the high costs of this new "Mecca" for harmonica/accordion-history interested people. Springtime 2016, when the opening date is fixed, we will have a big ad. campaign. I'll keep you updated. The arrival of "Beaujolais Nouveau" wine*, on the 16th of November, has now become a global event and Japan has not escaped this festive tsunami. In November 1999, an Air France cargo Boeing arrived in Tokyo Narita airport, loaded with 145 tons of Beaujolais Nouveau. I was invited that evening to take part in a musical party organized by Air France, to celebrate the event, in Tokyo New Otani Palace. In the plane, returning home, came to me the idea to organize the same celebration in Paris, every year. Thus was born the first musical "Harmonica-Beaujo" evening, held 1n November 2000 near Paris, in Enghien at the Octopus restaurant. Many will follow. Every year, because of the constantly increasing success, we had to change to gain space, from the Octopus to the "Boeuf Couronné", then the "Venezia", "La Butte" theater, "O'Cantina Cafe", etc. Great mmoments shared with Albert Raisner, Claude Garden, John Walton, Alexandre Thollon, the Hotshots, Nami Miyata, etc. Friends from all around the world. "Arts et Sciences Réunis" 161 avenue Jean Jaurès 75019 Paris. 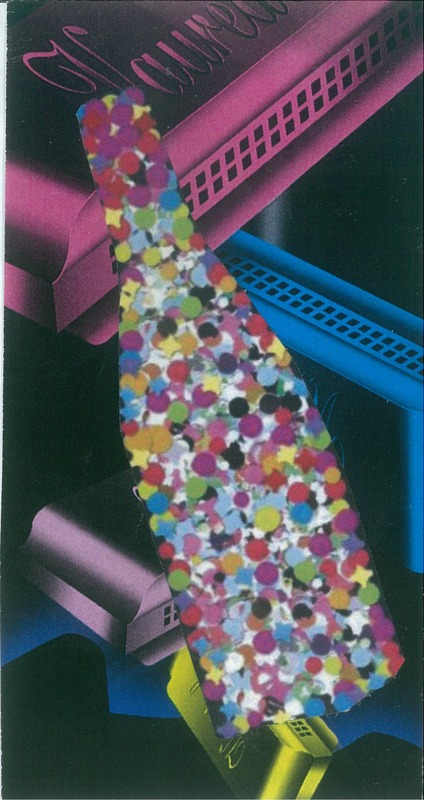 If you feel like it, you still have the opportunity to take part in this harmonica " rendez-vous ". * Beaujolais Nouveau, or Beaujolais Primeur, is a wine with a guarantee of origin, produced in Beaujolais vineyards, the grape variety is Gamay. It is traditionnaly put for sale worldwide on the third thursday of November. On Saturday, October the10th the Condat Harmonica Ressources is organizing a day of conference debate in the library "Le Bateau Livre", in Condat (87920) France. The theme of this debate will be : "Musicians and Concerts Organizers". Program : what are the relationships between the musicians and the shows organizers and what are the issues in a period shaken by globalization and new technologies booming. 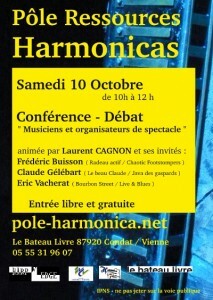 After a mini conference, Laurent Cagnon, the organizer of this meeting, will moderate the debate with his guests : Frederic Buisson, guitarist, singer of the group "Chaotic Foot Stompers", Claude Gélébart, singer, comédian, Eric Vacherat, singer, guitarist, figure of the Blues in France, leader of the group "Bourbon Street", which contributed to the coming international artists such as Joe Filisko and Brendan Power, godfathers of the 2014 Harmonica Festival in Condat. Do not miss this appointment, on the 10th of October. 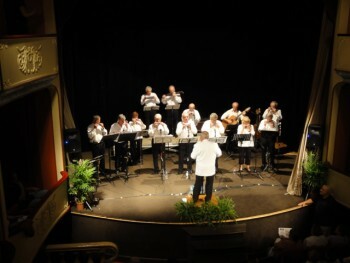 Harmonicas de France Orchestra was born under the leadership of Pierre Couteau and Charles Le Croller both experienced harmonica players. In 1965 Pierre Couteau was awarded the world champion prize in Delft, Holland, with his legendary trio « Les Trois de l'Harmonica ». These World Championships are held every four years under the auspices of the FIH (Federation International of Harmonica). The orchestra « Harmonica de France » comprises 12 harmonica players with Jean Saquy, Michel Sanchez, Alain Chaulet as soloists*... Without forgetting the three women in this group, icing on the cake, adding a tat more of everything to this orchestra. The Harmonica de France Orchestra will be featuring in the concert which will take place in the Chambles church at Saint Just Rambert, 42170, near Saint Etienne city, France. 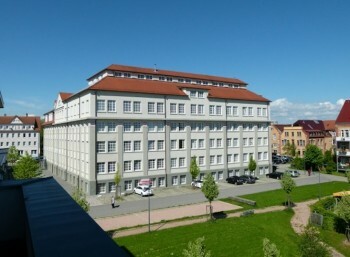 The « Trossingen Harmonica Masters Workshop » were created in November 2003 by Steve Baker, initiative in cooperation with « Hohner Musical Instruments ». The next edition will be held from November 4th to 8th at the new Trossingen Conservatory which is considered as one of the best place in Europe for learning musical instruments ; particularly in this case the Blues harmonica, favorite area of our friend Steve Baker. Assisted by David Barrett and Marko Jovanovic, Steve invites you to participate, during four days, at the « Best Of Modern Blues Harmonica Appointment », theme chosen for this Master Works 2015. Event ended with a concert to be held on November 7th in the evening ; featuring Steve Baker, David Barrett, Marko Jovanovic, Big Pete Blues BandFeat, and Alex Schultz. The interest of this event is to bring together professionals and amateurs from different horizons. Sharing knowledges is a source of progress for the music, the instruments and the instrumentalists. 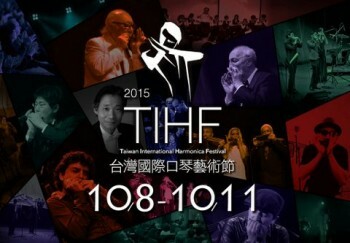 This Festival will take place from the 8th to the 11th of October at Taipei, Taiwan, led by the HAPA local harmonica association. A world meeting for harmonica lovers, the organizing committee proposes a lot of activities, including a "Taiwan International Elite Competition", a "Thematic Workshop" and an International Concert, program : The Adler Trio (Israel), Yasuho Watani (Japan), Masmi Oishi (Japan), Willy Burger (Italy), Mike Stewens (USA), among others, as well as the Sirius Harmonica Ensemble (Taiwan)... I particulary like this ensemble which reminds me of the Borrah Minevitch orchestra... updated. Let us wish a successful festival to our taiwanese friends.